Oslo is the capitol of Norway, crowned by natural beauty, adorned with a fjord, natural woodlands and parks. This eco-friendly city considers family and nature to be its national treasures. They have struck oil, and are now one of the wealthiest countries in Europe, with some of the highest living standards in the world. Oil surplus aside, the locals are slow to change, live modestly, and cling fast to their Nordic traditions and Viking heritage, with a deep reverence for their arctic surroundings. We spent 24 hours in Oslo, and discovered a model city where the Nordics live in a modern world, without losing their essence of what truly matters. There’s lots to see, so we made this list of the Top 14 Things to Do, and where to stay, dine, and how to get around. We started our walking tour from the Grand Hotel, centrally located to Parliament, City Hall, National Museum of Art, and the Royal Palace. These buildings all frame the central park, where there are bands and music often playing throughout each day. We are met by our guide, Yahel Blystad, who has an excellent knowledge of all the sites to see in Oslo. 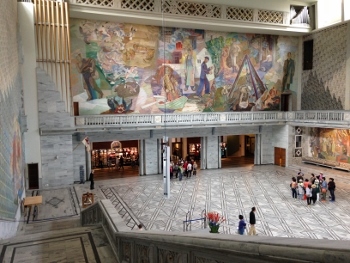 TIP: Purchase the Oslo Pass to get free entry to more than 30 museums, free public transport, and more! 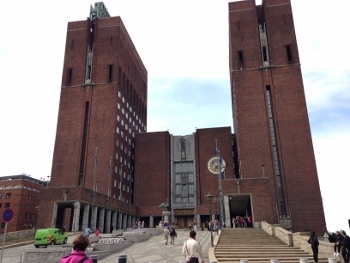 City Hall: This is the site where the Nobel Peace Prize award ceremony takes place. When walking up the steps to the city hall, look at the numerous hand painted wood carved murals with depictions of Nordic mythology (Thor, Oden) and history. Be sure to visit the 2nd floor to see Edvard Munch “Life” painting, as well as the banquet hall, city council room. One of the towers has 49 bells that play melodies play every 15 minutes, from 7 am to midnight. 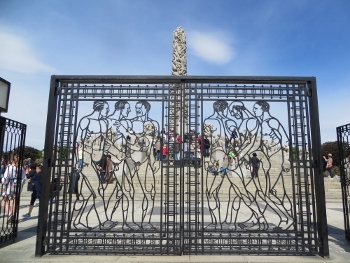 Park Gustav Vigelen: We ride the city tram through the beautiful Frogner neighborhood to Vigeland Museet og parken – largest sculpture park in the world! 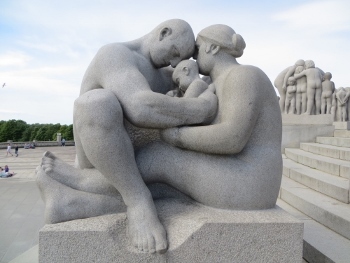 The beautifully designed park is home to 200 statues created from bronze and granite by Gustav Vigeland, (1869-1943). His chosen theme is “The Cycle of Life Eternal.” Every statue is a celebration of human love, care, capacity for compassion, moments from birth to grave—a true celebration of family! It is spectacular and instructive. 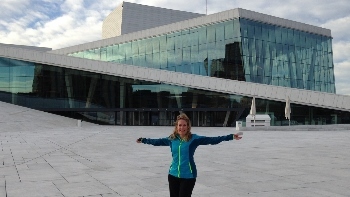 New life always rising and a must on our Oslo top things to do! 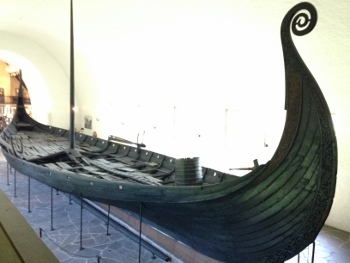 Viking Ship Museum: Visit the world’s best preserved Viking ship – Astonishing! See the elaborate wood carvings reflecting Nordic mythology, and surviving tapestries. Great way to gain insights to Nordic history. Norsk Folkemuseum: A visit to the world’s oldest open-air museum gives a glimpse into the Nordic culture. 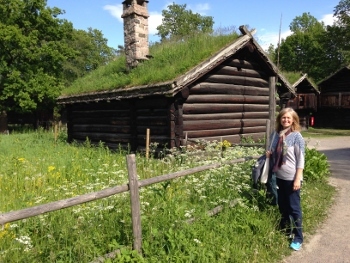 We were welcomed by hosts in traditional folk dress, and walked through several villages with restored buildings, farmsteads, and saw the Gol stave church. KonTiki Museum: Thor Heyerdahl, famous Norwegian explorer, crossed the Pacific in 1947 in a balsawood raft, the Kon Tiki, and you can see it here – incredible stories of Thor’s adventures at this museum. He continued to explore on other voyages using reed boats, the Ra & Tigris. FRAM Museum: Next door to the Kon Tiki Museum is the Fram, the world’s most famous polar ship! The Fram was a huge Polar vessel that made its way to the North & South pole guided by seafarer Fridtjof Nanssen. National Gallery of Art: Norway’s largest museum has an amazing collection of Norwegian and foreign artists. We saw “Livets Dans” or the Dance of Life with collections by Adolph Tideman, Edvard Munch (got to see one of four “The Scream” variations), Monet, Picasso, Cezanne, Peder Balke, Christian Krogh, Matisse, Gaugain, Manet. Akershus Fortress: Learn about Oslo’s history at the medieval castle and fortress built in 1299. Mathallen Food Hall: We heard this food hall is a great place to visit and buy high-quality products from Norwegian producers. Opera House: Spectacular modern architecture! Definitely worth a visit. Stroll up the incline of the building to the sloping rooftop, then over to the other side. Noble Peace Center: This center presents works from past and present Nobel Peace Prize winners to encourage dialogue on war and peace. Currently, there’s an exhibit sharing Malala Yousafzai’s story and her efforts to help children. 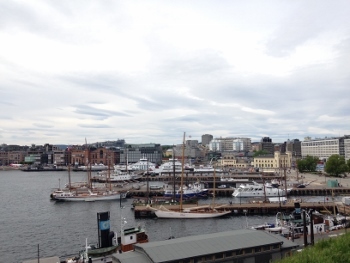 Such a neat spot from our Oslo top things to do list! Astrup Fearnly Museum of Modern Art: Designed by Italian architect Renzo Piano, you can see this museum from the harbor and waterfront – the architecture is very unique and worth a visit. Holmenkollen Ski Jump: Last but equally as great from our Oslo top things to do–Visit the world’s most modern ski jump! The Grand Hotel: We stayed at the luxurious Grand Hotel on the main square in the heart of Oslo. It’s an historic landmark, central to many of the city’s landmarks. The hotel café was frequented by local artists and writers for many years—Henrik Ibsen is said to have eaten lunch there every day. Also, painter Edvard Munck regularly came by. It is within walking distance of Parliament, City Hall, National Museum of Art, and the city palace built by one of the Swedish Kings. Our room was beautifully designed and spacious. Service impeccable! Breakfasts at the Grand Hotel are grand! All kinds of smoked and steamed fish, cold cuts, cheeses, vegetables, olives, lettuces, yoghurts, berries and fresh fruit, waffles, eggs, bacons and sausages, oatmeal cooked in milk, all manner of jams and jellies, honey and nuts, hearty breads and butter. 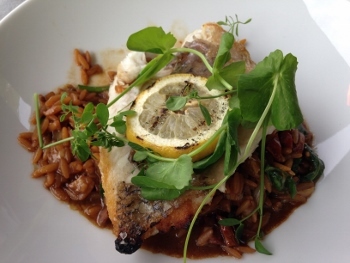 Here are our top things to dine in Oslo! Festningen Restaurant: We highly recommend dining at this elegant brasserie restaurant next to the original Olso fortress with incredible views of Oslo’s main harbor. We enjoyed the chef’s recommendation beef carpaccio salad, a raw thinly sliced beef salad, and main course fresh, moist sea bass. 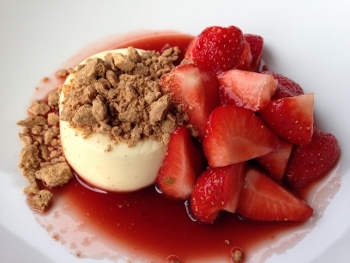 For dessert crème and berries—memorably delicious. Ferry to Museums and Islands Take a ferry at City Hall, Pier 3 to visit the museums at Bydgøy. 1st Stop: Viking Ship Museum & the Norwegian Museum of Cultural History. 2nd Stop: Polar Ship Fram, Kon-Tiki Museum, and Norwegian Maritime Museum. Free with the Oslo Pass. You can choose from a fleet of sedans, SUV’s and limousines, and VIP Protection & Security will ensure your comfort and safety. 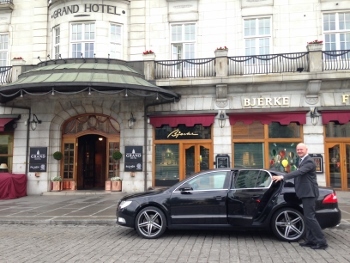 Owner Ken Torkildsen was our private chauffeur, and we were impressed by his professionalism and level of experience. The Global Adventuress Team would like to thank the Norway Tourism Board, and Fjord Tours for hosting our “Sognefjord in a Nutshell” Tour! 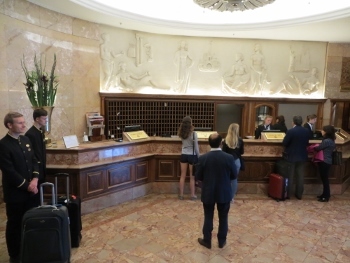 A special thank you to The Grand Hotel in Oslo for hosting our stay, and the Oslo Tourism Board for providing us with a tour of this beautiful city, and V.I.P. Protection & Security for chauffeuring us to the airport. As always, we are grateful to Travelpro for providing us with a carry-on spinner suitcase for our journey, and DK Travel for the helpful Norway Eyewitness Travel Guide. Norway Tourism Board Ready to plan your trip to Norway? Visit the Official Norway Tourism site to get started. Oslo Tourism Board To help you plan your stay in Oslo and find the top sites & attractions, visit this site or the tourism office in Oslo. Grand Hotel Highly recommend staying at this luxury hotel in the heart of Oslo! The service is excellent, and the rooms well-designed, spacious with comfortable beds. V.I.P. Protection & Security If you need an airport transfer, private chauffeur, protection and security services, you’ll want to contact V.I.P Protection Services. Travelpro The choice of flight crews and frequent travelers and Global Adventuress! We love our merlot colored carry on spinner and take it everywhere we go.